These MVHS students are Dressember participants. They are wearing dresses, despite the rain, to advocate for human trafficking awareness. MVHS takes on the challenge of diminishing modern-day slavery, one dress and dollar at a time. Human trafficking is the modern day equivalent of slavery and it consists of the use of force or any other unethical type of coercion method for physical labor or sexual exploitation. It is one of the largest industries in the world, generating around 99 billion dollars a year and taking place in over 137 countries (including the U.S.). This practice is one of the most unethical things currently happening in our world and awareness about it is more important than ever. People need to understand that slavery in the form of human trafficking is still existent in this world — and something needs to be done about it. Several efforts for awareness and aid to human trafficking have come through a huge organization called Dressember. This organization is a program that encourages advocates to raise awareness for human trafficking by wearing a dress (or tie if you are a male participant) every day during the month of December. Additionally, these advocates usually have an individual or team fundraising page where people can donate to the cause. These donations go towards human trafficking relief efforts. But you may ask, why the dress — especially during December, arguably the coldest month of the year? For starters, it sparks conversation. During this chilly month, many advocates of Dressember will be asked why they are wearing a dress. This gives them a perfect opportunity to talk about the horrors of human trafficking and modern day slavery while hopefully prompting the listener to donate to the cause. People all around the world are participating in Dressember — even in Canada and other countries with cold climates. Proponents consider wearing a dress for one month as a minor inconvenience compared to what enslaved people around the world have to endure everyday. Dressember has done a great job advocating for human trafficking relief and helping victims with care, case management, and integration back into society. They have a goal of raising over three million dollars during this month and are already at $850,000 (as of December 9th)! At Mission Viejo High School, efforts for Dressember have been growing and have become extremely effective. Last year (December 2017), Ashley Johnson and Emma Hicken, two MVHS students, participated in Dressember and raised over $750 through their fundraising efforts. 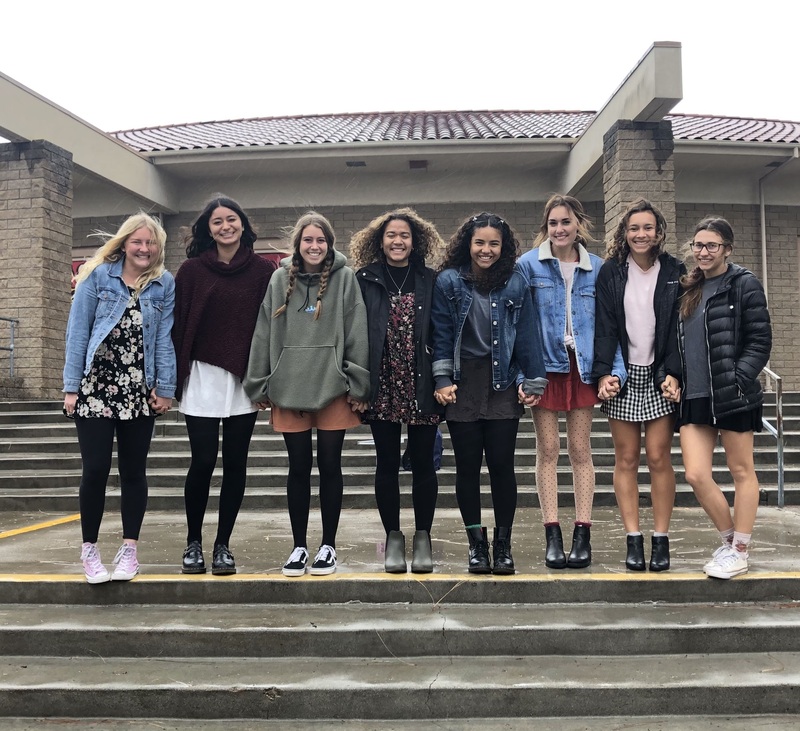 This year, there are over 15 girls participating in Dressember at MVHS and the increase in the amount of participants this year have already accounted for over $1,670 raised (per December 9)! These advocates at MVHS have been posting on social media daily, raising money through online donations, and talking about the cause with anyone who asks them why they are wearing a dress. The increasing amount of participants at MVHS have also educated their peers about the cause more than ever before, spreading awareness to many students that had no idea what human trafficking was and helping many students, and even teachers, to understand that modern day slavery is a reality. When asked why this cause was so important to them and why they decided to participate in Dressember, Ashley Johnson and Satouri Robins responded with details of their personal motivation. “Los Angeles and San Diego are two of the biggest human trafficking centers in the U.S., and this made me realize how close and how real this issue is to me. I am so thankful that I can make a difference by just wearing a dress for 31 days!” Johnson expressed. “Human trafficking and the enslavement of people is such a huge problem, but no one really talks about it consistently or actively tries to work towards an end… I personally hate dresses so I thought it would be a good way to push my boundaries and do something I normally wouldn’t for an extremely important cause,” Robins answered. Dressember is clearly a very important cause and passionate advocates such as Satouri and Ashley along with the rest of the participants here at MVHS are what make Dressember possible. So be bold and donate to their cause, tell them how great they are for wearing dresses all month, spread human trafficking awareness to others, join the Dressember movement by wearing a dress/tie , or simply support someone in need during this holiday season! *To donate to Dressember, learn more about the cause, or see how the donations are utilized, visit dressember.org/donate, or go to the social media pages of these Dressember volunteers and make a difference in someone’s life today.